ANAHEIM, Calif. -- "The Yankees showed quite of bit of interest," Bobby Kielty said over the phone yesterday, moments after signing a minor league contract with the Red Sox, "but I definitely felt I'd rather play with the Red Sox than the Yankees. Boston was No. 1 from the get-go." There are few words that will more instantly endear a player to Sox fans, but Kielty's affection for the team is neither a recent creation nor a manufactured one. In the old mill town of Fitchburg in north-central Massachusetts, the Kielty name still has some currency. For 37 years, Kielty's grandfather, John, walked his routes as a mailman in Fitchburg. Kielty's great-uncle, Frank, taught at Fitchburg High. And his father, Roger, has a pedigree that is pure Fitchburg: He played hockey on Greene's Pond, hung out at Whalom amusement park, and attended St. Bernard's grammar school, B.F. Brown Junior High, and FHS, where he was the star fullback on a Red and Gray team that defeated archrival Leominster two straight years in one of the country's oldest Thanksgiving Day football rivalries. "I was the fullback, but I got to call the plays," Roger Kielty said yesterday by phone. "I called a lot of plays where I got to run." Roger Kielty went on to play football four years on a full scholarship at Boston University. "I had a rocky career," he said, though he spent one memorable afternoon as the roving linebacker attempting to shadow Ernie Davis, the legendary Syracuse running back. Shortly after finishing college, Roger Kielty followed his parents out to Southern California, where he spent 33 years teaching high school math and coaching a variety of sports, including football at St. John Bosco, the prep school in Bellflower attended by Nomar Garciaparra. 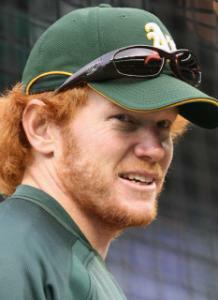 "My dad took me to the playoff series in 1986 when the Red Sox played the Angels," Bobby Kielty said. "I rooted for the Red Sox." Eventually, Bobby Kielty succumbed to the allure of the Angels ("Tim Salmon was my favorite player," he once said), but a summer spent in New England proved a springboard to a career in baseball. Undrafted out of high school, junior college, and one year at the University of Mississippi, Kielty played in the Cape Cod League in a summer that turned magical: He led the Brewster Whitecaps in eight offensive categories, fell one home run shy of becoming the league's first Triple Crown winner, and received a six-figure bonus to sign with Minnesota. Three years later, he was in the big leagues, a teammate of David Ortiz on the Twins. Now, at age 31, he is reporting to Pawtucket with hopes of joining Ortiz on a Sox team in the market for a righthanded-hitting outfielder who could supplant Wily Mo Peña as the team's top outfield reserve, although there are no guarantees the Sox will make that move with Kielty. Kielty has an uncle, John, who went to MIT and lives in Hamilton, and an aunt, Agnes Pallozzi, who lives in Concord. "I got a lot of phone calls from people when they heard the Sox were interested," Kielty said. "People were pumped." Ideally, manager Terry Francona would like an outfielder who also could spell Coco Crisp in center field. Kielty has spent his 579 games in the big leagues with the Twins, Blue Jays, and Athletics mostly playing the corner outfield spots, but he has played center. "My first big-league callup, with the Twins, was when Torii Hunter went down with an injury and I had to play center field," Kielty said. "Later, when Torii needed a day off or missed a couple of games, I played center. In Oakland, we had guys like [Mark] Kotsay, [Jay] Payton, Milton [Bradley], but I definitely can play center field." Roger Kielty's favorite players growing up, he said, were Bobby Doerr and Dominic DiMaggio. "The Little Professor," he said of DiMaggio. "He used to make these terrific shoestring catches. Outfielders leave their feet a lot these days, but Dominic would come in and make these shoestring catches." Bobby Kielty left his feet to make one of the best catches of the last decade at Fenway Park. He was playing right field for the Blue Jays when he went airborne to catch a drive by Trot Nixon that was headed for the bullpen. Kielty crashed into the bullpen barrier, and held on for dear life. "I latched on to the wall," he said. "I didn't know you could flop into the pen. I thought it would be a home run if I did. I was gripping the fence as hard as I could, and my feet went up in the air." That was four years ago. A year later, Kielty was with Oakland. He'd heard rumors a couple of years ago that the Sox had some interest (they acquired Payton instead), but he was still with the Athletics this spring when he injured his left knee in a rundown, tearing the meniscus. He returned in early April but then tore his left calf muscle. The Athletics placed him on the 60-day disabled list, and he had played in just 13 games when Oakland designated him for assignment July 21. Ten days later, he was released, but it was only yesterday that he came to terms with the Red Sox. "I'm excited, very excited," he said. "Waiting for a phone call was stressful. I really want to get going and help out as much as I can." The plan, he said, is for him to get as many at-bats as he can with the PawSox in the next week. "It's just a matter of getting at-bats and showing them I'm ready to play," Kielty said. "I'm sure if they're happy with what they see, something will happen. But there are no guarantees."